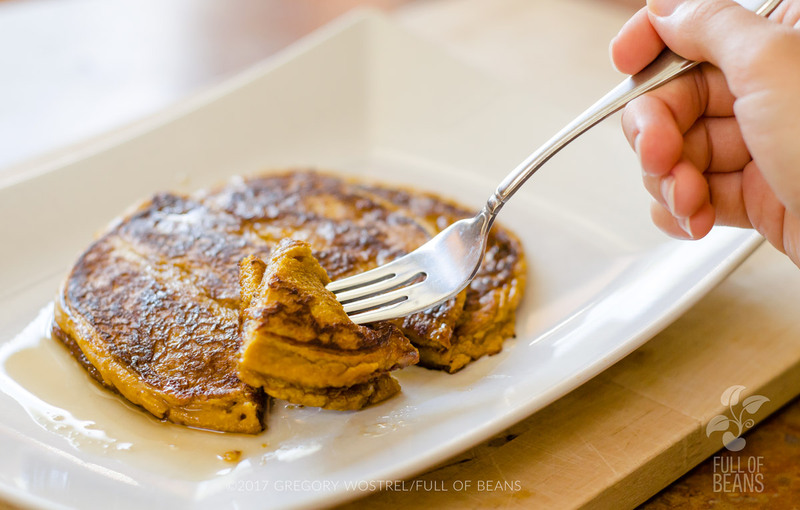 Pancakes suggest a more indulgent and lazy start to the day, but these gluten-free, oil-free, vegan pumpkin pancakes come together in a hurry and provide a powerhouse of nutrients and health benefits. When the mornings start to feel cooler and the days are shorter, starting the day with something warm and hearty can be very soothing. 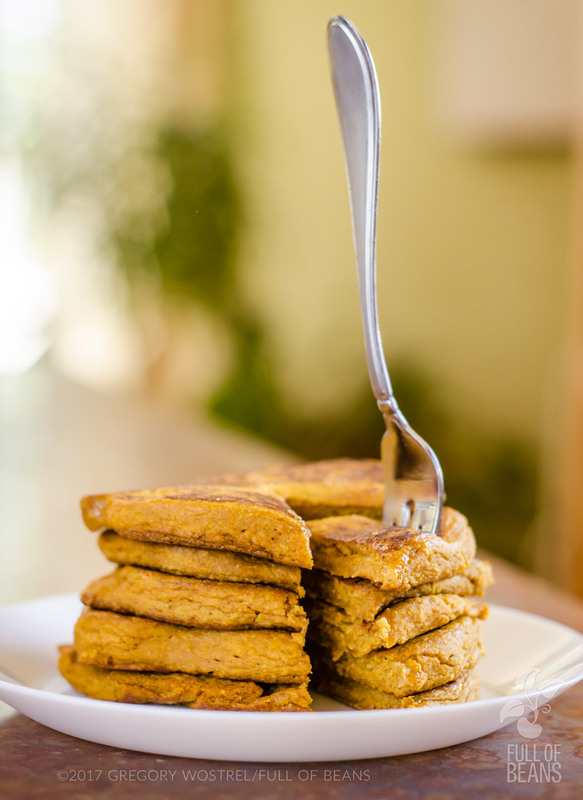 These vegan pumpkin pancakes are easy to love. Oil-free, egg-fee, and dairy-free, they are dramatically less calorie-dense than traditional pancake recipes, and let’s not forget the health benefits of eliminating all that cholesterol! 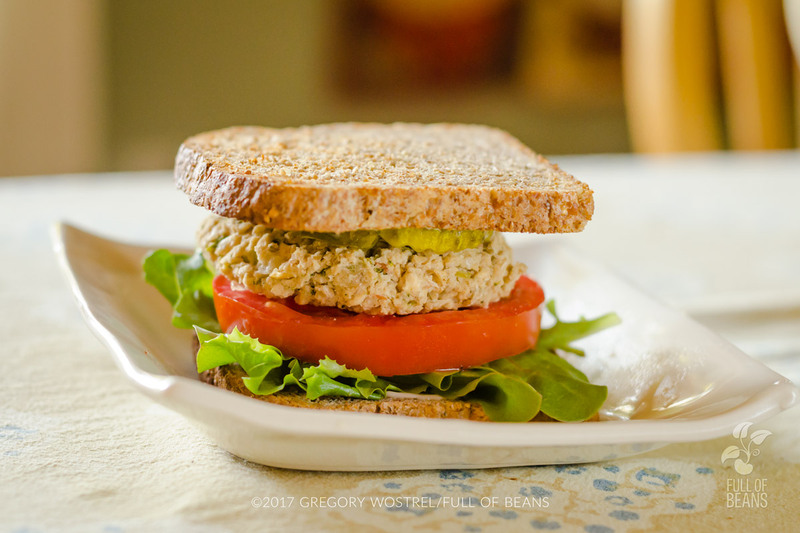 In addition, substituting gluten-free oatmeal flour (that you can make yourself!) means none of that stack-of-wheat-pancakes bloated feeling. If that isn’t enough – they have this wonderful pumpkin color, too! Sure, once Fall approaches in these parts everyone starts to talk about the Fall flavors: cinnamon, nutmeg, and of course, pumpkin. Since the Fall also happens to be the actual harvest time for pumpkins, that makes sense. We’re writing this post in late September so we’re jumping on that bandwagon, too. However, pumpkin is a nutritious ingredient and a wonderful taste that is worth working into your day anytime of the year. Plus, it also is an effective substitute for butter or oil in baking! Pumpkin, like other orange vegetables (carrot, butternut squash, and sweet potatoes, to name a few) are packed with vitamin A, beta carotene, potassium, vitamin C and fiber. Pumpkin is actually a nutrient-dense low-calorie powerhouse that doesn’t get the attention it really should. Finding ways to work pumpkin into breakfast is an excellent way to start the day. Oatmeal is a Power Player, Too! Oatmeal also offers some great health benefits. It is rich in fiber, vitamins, minerals and antioxidants. It is really a wonder food. 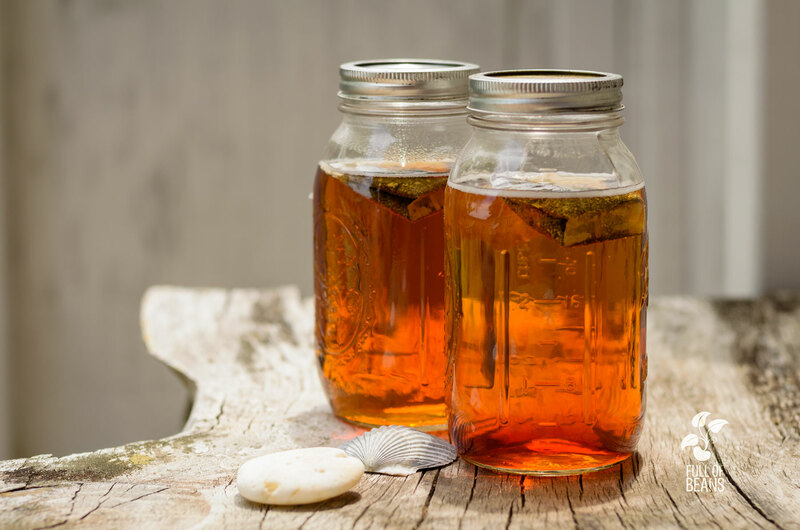 Studies have shown that it has a positive impact on blood pressure, blood sugar levels, and cholesterol. It has a compound called beta-glucan, which can increase your feeling of fullness. This compound promotes the release of the satiety hormone in the gut, resulting in a reduced calorie intake and decreased risk of obesity. 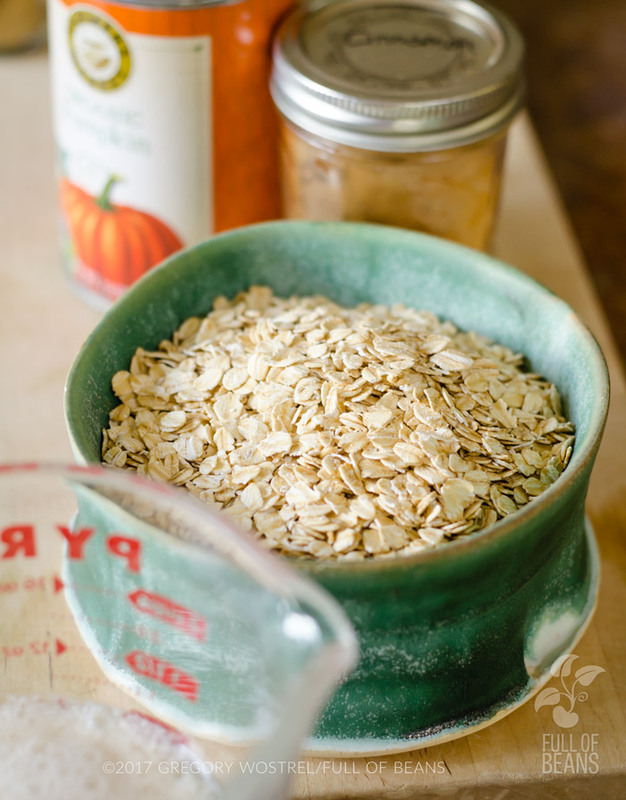 Finding ways to include oatmeal in the diet has great benefits. BONUS: oatmeal is cheap!! Particularly since we buy organic oatmeal in bulk. In a sealed container, it has a very long shelf life. Even so, I confess that I am not a huge fan of a bowl of oatmeal (even with raisins and cinnamon). I mean, I will eat it, but I would much rather have my oatmeal in pancake form (or cookies, but that is another post). Our daughter is quite gluten-sensitive, but she also loves pancakes (OK, we all do). 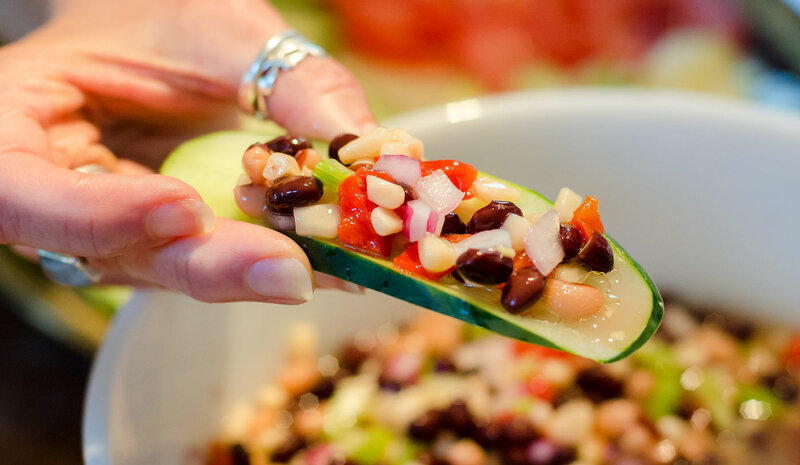 So I had been looking around for a good vegan and gluten-free recipe rather than trying the various GF mixes that you can find at coops and health food stores. We found one that we really love at Kitchen Treaty (Gluten-free Banana Oat Pancakes). After having them several times we started thinking about what else we could do using the same approach. That’s what brought us to this delicious recipe with pumpkin as the star. Please consider giving these easy, delicious, and guilt-free pancakes a try! When edges start to look dry, flip them and cook until lightly firm to the touch. The batter thickens up as the oats absorb the liquid. Be prepared to cook the pancakes soon after the batter is done. Even when it thickens, the pancakes will still be fine, but harder to spread on the pan.